This past weekend we celebrated Katie's family day. A day to remember how we waited for her to come home and those moments of seeing and holding her for the first time. She has grown into a beautiful girl and I feel so privileged to be her Mom. Our trip to Korea has started some conversations and questions with her. Many we do not have answers for, and many she may explore as she grows. 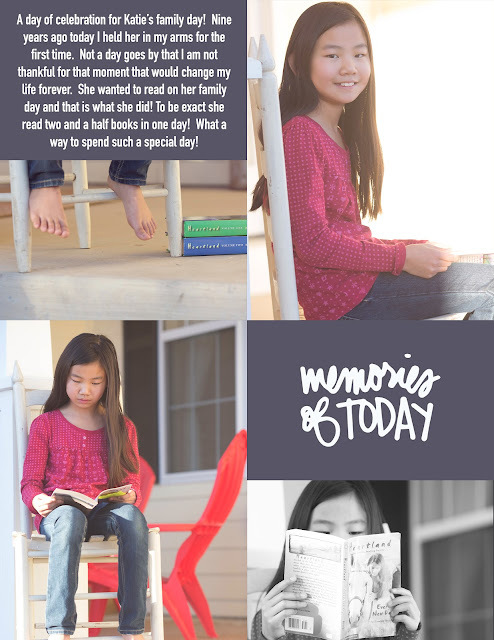 She told me her perfect birthday party would be for everyone to bring a book and read the day away:) Oh my girl I don't know about anyone else, but I sure want an invitation to that party!